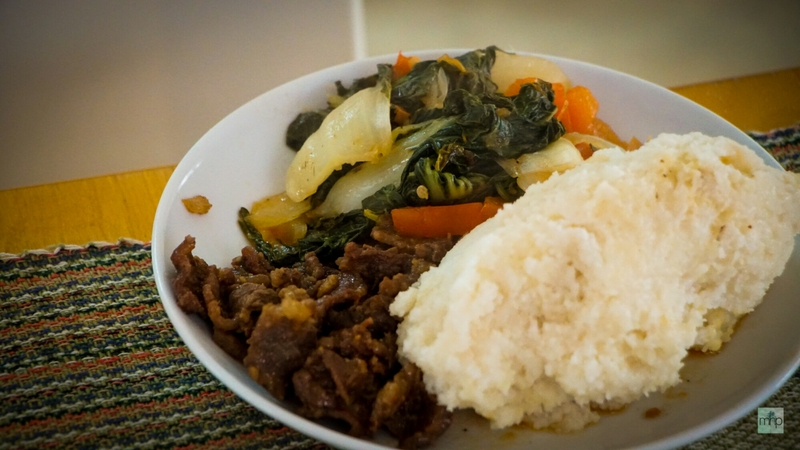 Ugali, a popular dish in East Africa. Photo: Matt Haslam. Can you please tell me about your position in Refugee Union? My name is Alex*, I volunteer my time running the Refugee Union in HK. I’m the secretary, I handle all communications and administration. This involves the usual day-to-day work in an office, I attend to people who come to the office seeking help. I seek solutions to their problems. I also handle communications for the Union through our Facebook as well as the blog. Can you please tell me more about your job? What people do you encounter? How do you interact with them? How do you like your job? It’s good, the impact it has on people’s lives is quite significant. Being a secretary to the Union, am the face that the public see and meet as I act as the interface between refugees and the various publics in the office. We assist all refugees who come to us seeking help. Many of them are not able to write or communicate in English, this is one of the most challenging aspect of my job. We go out of our way to understand their needs to enable us offer practical solutions for their problems. Majority come here [to the Refugee Union] because they want to surrender to immigration, they are afraid that if they were to surrender on their own they would be arrested and detained. When they come to us we put their USM claim through to immigration on their behalf. We have experienced situations where individuals have tried unsuccessfully to lodge a USM claim at Kowloon Bay, ImmD rejected to accept their claims, so they come here and we put in a [protection] claim on their behalf and they are accepted. We also assist with appeals for those whose USM claims have been rejected by ImmD. We also help those who want to pursue judicial review, which is a challenging minefield to navigate. In other instances we offer legal advice because we can access lawyers who are able to advise people. On Welfare, we advise and assist the claimants on how to access the welfare system. Sometimes it’s very difficult to get into the system. When they go on their own to try and access welfare many fail. From the office Refugee Union liaises with Social Welfare Department which ensures that the individual is registered and accorded the much needed humanitarian assistance as they call it (SWD). We have seen many cases of individuals who tried seeking registration, unfortunately they are turned away with very flimsy excuse that your name doesn’t exists in our database. They are easily turned away from the offices from where they are supposed to get help from. We help them by linking them with social welfare departments who in return refers them to ISS Hong Kong, who manages the Welfare assistance for the refugees in Hong Kong. I have come across people who are given less welfare than what is in the existing Government policy. The current policy stipulates that rent assistance is to be disbursed at 1500 for an adult, 750 for kids while 300 is paid for utilities. But while this is directive from the Government we have seen many instances where some people who are given 1200 for rent while none at all for utilities. In this case we intervene and make sure they get what they are entitled to. Refugee Union helps the members to bridge the welfare gap, the welfare gap brought about by this shortfall is so huge, this is so because the welfare assistance that refugees receive is grossly inadequate. It cannot meet the basic human need of an individual, both food and rent is not enough. It’s impossible to survive on 1200 for food as that translates to 40 dollars a day [Breakfast, Lunch & Dinner], while a rental assistance of 1500 cannot secure a decent accommodation in Hong Kong. Therefore we seek donations from organizations as well as individuals who are philanthropic enough to donate to our course. We then distribute the same to the members of the union. This way try to bridge that gap. Refugee Union offer refugees a platform where they are able to come together and can articulate issues affecting them. They are able to come together, with the numbers, they can form a negotiating block that can push the government to change policies affecting them. Most memorable thing that happened in your work? Rewarding experience during your work? To see people who came to us while in a hopeless situation, we strive to assist them in whichever way that we can. There was also a time when we went to court and we were able to save some people who were to be deported. So that was a big, big thing. A guy was about to be deported, Refugee Union with the help of lawyers intervened and prevented that from happening. He was a guy from India, his claim was rejected and so they wanted to deport him. He claimed that it was not safe for him to go back so we went to court and we succeeded in [our case against] immigration. With financial resources, Refugee Union can do much for the refugee community. Can you tell me what you do outside work? I do nothing, go to church maybe, with family, we go out to have lunch or dinner. There’s nothing more to do. I don’t have much activity because Hong Kong is an expensive city, things we want to engage in are financially impossible. When I’m alone, I would cook. What was the dish you made just now called? 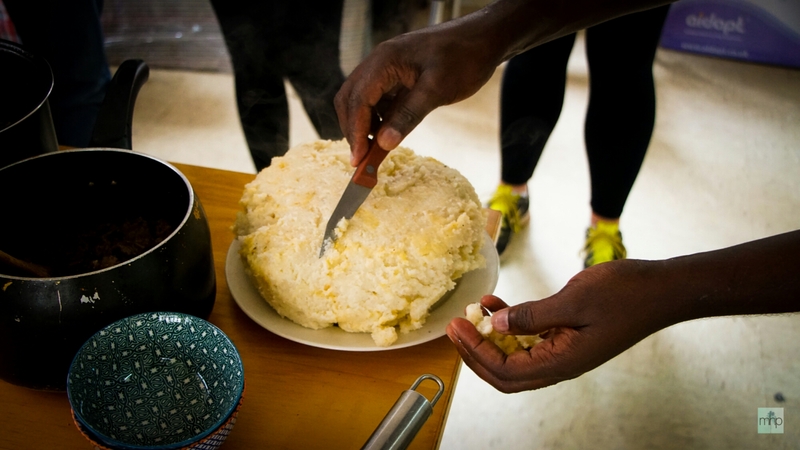 It is an East African dish called Ugali. It can be prepared with Maize flour, Cassava or millet and sorghum. Its best served with beef and vegetables. Why did you choose to demonstrate this dish today? Because it is a signature dish from my country. It’s our staple food. It is the food that people eat most of the time, it’s very popular and easy to cook. What’s the cultural history behind the dish? How long has it been around? Why and how did it become so significant? It’s easily available, easy to prepare and cook and the nutritional value quiet high, it is high energy kind of food, good especially for those people who do manual work. I know it has existed for many generations I don’t know from when, I don’t know how it started but it’s food that my great grandparents used to cook and which my mother is still cooking today. So has the recipe been modified and changed? You said in the kitchen you use a different type of spatula because you can’t find the flatter/ right one here? I don’t think you can change it. What you can change is the accompaniments that you serve with, you can serve with milk, meat and vegetables. It’s a simple dish to prepare, you need water, bring it to boil, then mix with flour. What’s your favorite ingredient in the dish? I think the best is beef, it’s convenient to prepare. How does the dish reflect your country? What does it tell us about your country? Is it a very agricultural country? Yes, it is a very agricultural based economy. It reflects people’s health, people like eating together through sharing. The dish is rich in starch and energy. Its ideal for those who work hard. It has a balanced diet having meat and vegetables, some people will even add eggs. You can use it as a main dish and you can accompany it with other food based meats, it goes well with so many other foods. How does cooking help preserve your culture when you come here? Because when you eat this food, you are satisfied and feel energized. When I eat it, I enjoy it a lot, it makes me remember my country, nice memories, and good things worth remembering. What are the good memories associated with the dish? The communal kind of feeling, you know in my country, people share a lot and help each other. Food brings people together.